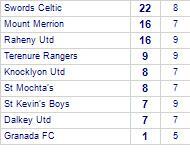 Dalkey Utd's last game was a 2-2 draw at home against Verona FC. 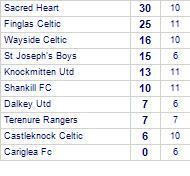 Dalkey Utd's last game was a straightfoward 1-3 win away against Castleknock Celtic. Cariglea Fc has yet to win in this competition, having lost all 3 games. 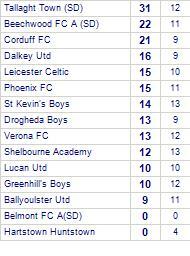 Dalkey Utd's last game was a straightfoward 2-4 win away against Leixlip Utd. 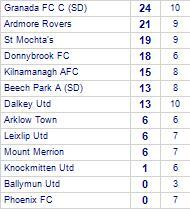 Ardmore Rovers's last game was a confident 5-2 win at home against Kilnamanagh AFC. 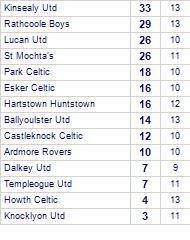 Dalkey Utd's last game was a comprehensive 6-2 loss away against Hartstown Huntstown. Blessington AFC C (SD)'s last game was a unlucky 4-3 loss away against Lucan Utd. 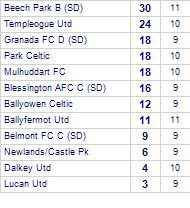 Dalkey Utd's last game was a disappointing 2-4 loss at home against Mulhuddart FC. Granada FC are defeated by Dalkey Utd. 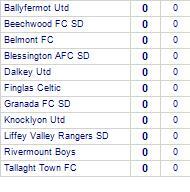 Loughshinney Utd despatched by Dalkey Utd. 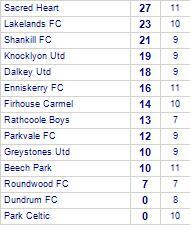 Enniskerry FC suffer defeat to Dalkey Utd. 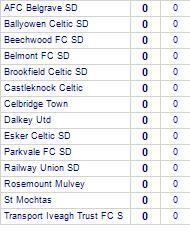 Dalkey Utd have yet to be beaten away from home. 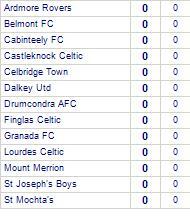 Leixlip Utd beaten by Dalkey Utd. 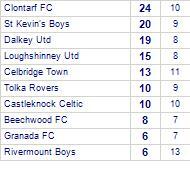 Castleknock Celtic suffer defeat to Dalkey Utd. Dalkey Utd lose to Mulhuddart FC.